Thomas Everitt Rogers was born in Bulloch County, Georgia on October 23, 1832. He had six children born before his enlistment in the Confederate States Army in 1862. Thomas E. Rogers joined the Confederate States Army in Savannah, Georgia on June 13, 1862, sworn in by Captain Robert L. Miller and served in Company C of the 21st Battalion, Georgia Cavalry until February 13, 1864. On this date 3 units, the 21st Cav., 24th Cav. and the Hardwick Mounted Rifles, were consolidated to form the 7th Regiment, Georgia Cavalry. Private Rogers was assigned to Company B of the 7th Georgia Cavalry Regiment. The 7th Georgia, along with numerous other southern cavalry regiments, served in the Army of Northern Virginia. Wounded in the Battle of Trevillian Station, Thomas E. Rogers survived the first days’ battle only to be captured on June 12 during “the wedge” engagement involving U.S. Brig. General George Armstrong Custer and C.S.A. Major General Fitzhugh Lee. War record indicates that Rogers was a very sick man at the time of his capture. His name appears on a roll of prisoners of war at Point Lookout, Maryland (Fortress Monroe), dated June 20, 1864. 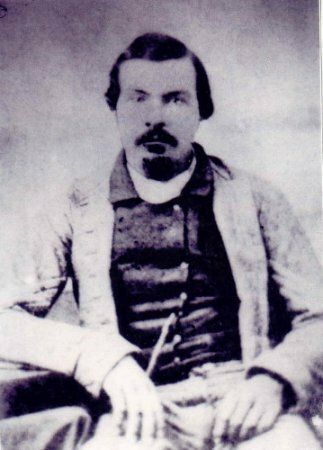 Thomas Rogers was later transferred to the infamous Elmira Prison Camp at Elmira, New York, arriving the end of July 1864. On October 17, 1864, Thomas E. Rogers was among a group of prisoners selected for exchange. He was too weak, and physically unfit to make the trip and by the time the train came to halt at the City Point exchange base near Washington, he was removed from the train to an area hospital, but it was to late. He was received October 16, 1864 at the West Building of the U.S.A. General Hospital in Baltimore, Maryland, where he died that same day. There is strong evidence that Thomas Everitt Rogers is buried at Loudon Park Cemetery in Baltimore Maryland. Information provided by Alan R. Laros, G G Grandson of Thomas E. Rogers.